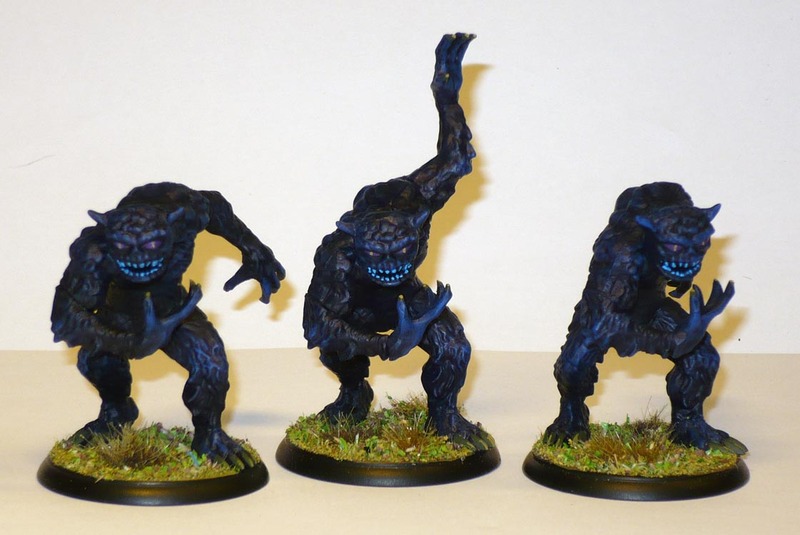 Some superfast Night Terrors from Shadows of Brimstone: City of the Ancients today. I chose to paint them close to the “official” paint scheme. These monsters are more or less the most “normal” looking monsters in the SoB games. Large humanoid and shaggy, black as night, they strike from the darkness of the mine tunnels. And quite scary in game as well, being large and quite tough adversaries. The one with the arm up is an easy conversion, simply by gluing the arm up instead of down…One being different makes it easier to portray leaders or tougher individuals as the scenario sometimes calls for. I chose to paint the teeth in a mid/light blue to leave the model in the dark, so to speak. 40mm bases, polystyrene HIPS plastic.